One navy blue or black large popm pom to be the sky. Then take some pipe cleaners and twist them into coils around your finger. Push one end into the centre of the pompom and secure it by bending in over the yarn that holds all the strands together. The yarn will help hold them in place. Make a series of them and hang them in a wreath or at the window. Use sparkly pipe cleaners if you have them to hand or decorate the pom poms by spraying glue and glitter on, or stars or even by using sparkly thread wound in when you make it. If you remember to leave the yarn that ties it together as a long thread, you’ll have a loop to hold it together. 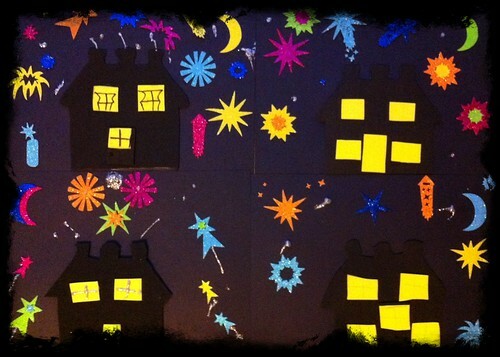 We didn’t, so you get Josie’s fingers modeling this quick and fun bonfire night activity. I think with some glue and glitter and sparkly pipe cleaners, they’d look great hanging in a window as long strands of dangling indoor fireworks! Well, in an effort to get some Firework Night crafts up on the site, we’ve made up a few patterns that we haven’t had time to make for real yet. (I lie slightly, Maddy made up the rocket using real beads, which is why it is quite a lot better than my other ones!) Still, hopefully these will give you a few ideas to get started; hexagons, circles and starts with different colours and patterns would look great. We had plans for a mobile but half term is rushing by a bit. This one is pretty lovely, done on a large square board. Maddy used gold beads for it which look great – I think the catherine wheel below would suit some gold hama beads too. Hmmm… I’m not sure about that one really… you could send me your own ideas? Once you’ve made a heap of stars in different combinations, you might want some tails to swoop about after the explosions. This one is a bit of a cheat because I’m not sure how much time for Bonfire Night crafts I have this year, so I’ll just post up a bit of fun that was previously on our family blog.